On March 8, Donald Trump loyalist Kyle Chapman was released from jail after being arrested on suspicion of felony assault with a deadly weapon and carrying a concealed dirk or dagger when violence broke out between Trump supporters and anti-fascists in Berkeley, Calif., on March 4. Earlier this week, Gavin McInnes—co-founder of Vice magazine—announced that Chapman was teaming up with his “alt-right” group, the Proud Boys, to form their own paramilitary wing of the alt-right called the “Fraternal Order of the Alt-Knights,” or FOAK. If you have no idea who Gavin McInnes is, get on your knees right now and thank dark-skinned, cocoa butter, do-rag Jesus. McInnes left Vice 10 years ago because ... well ... he was just too racist. Since then, McInnes has been known for inflammatory, racist remarks such as calling Asians “slopes” and “riceballs,” referring to Muslims as “stupid,” inbred and violent, and defending the use of blackface and the n-word. McInnes’ main contribution to society is the Proud Boys, a white-loving, “pro-Western” fraternal organization. The Proud Boys actually sponsored the Berkeley protest in hopes that it would turn into a melee. 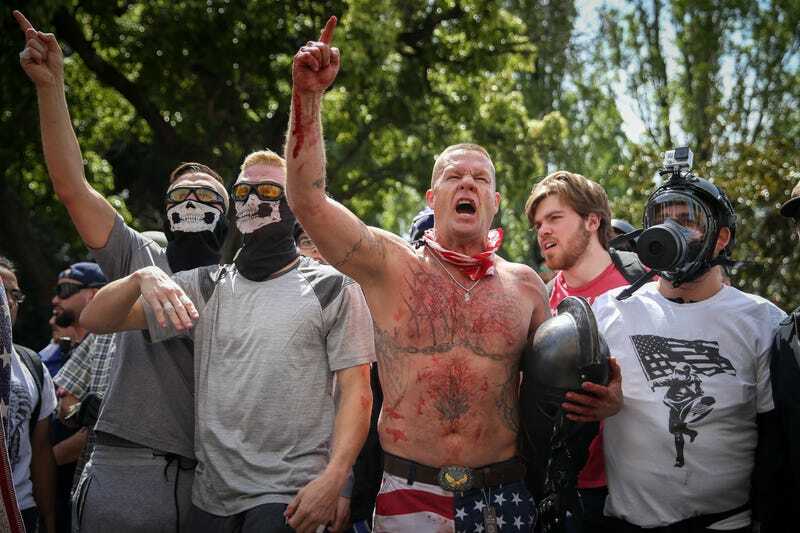 They dress like skinheads, love Trump, must get “jumped” into the organization and are required to fight anti-fascists at public rallies; membership also requires tattoos. If this sounds like a street gang, there is one other weird rule that Proud Boys must follow: No masturbation (which kinda explains the group’s aggressive, chauvinistic attitudes). At least we know they won’t be beating their mea .... never mind.